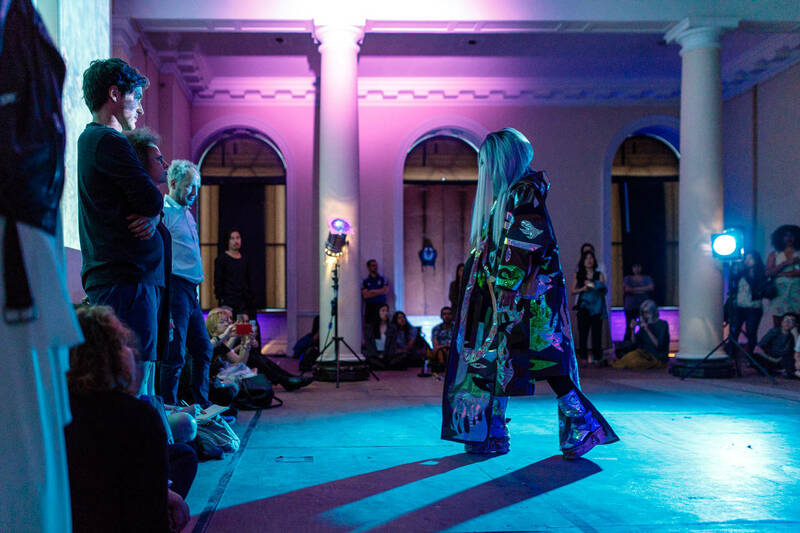 On a sweltering summer’s afternoon, Somerset House hosted the premiere of Canadian visual artist Zadie Xa’s fantastical new piece. Crash, Boom, Hisssssss. Legend of the Liquid Sword is an immersive piece of visual and oral storytelling. In this fascinating production Xa delves into the problem of cultural identities facing the Asian diaspora community. Crash, Boom, Hisssssss. Legend of the Liquid Sword was performed in the New Wing, which overlooks the stifling Waterloo Bridge. 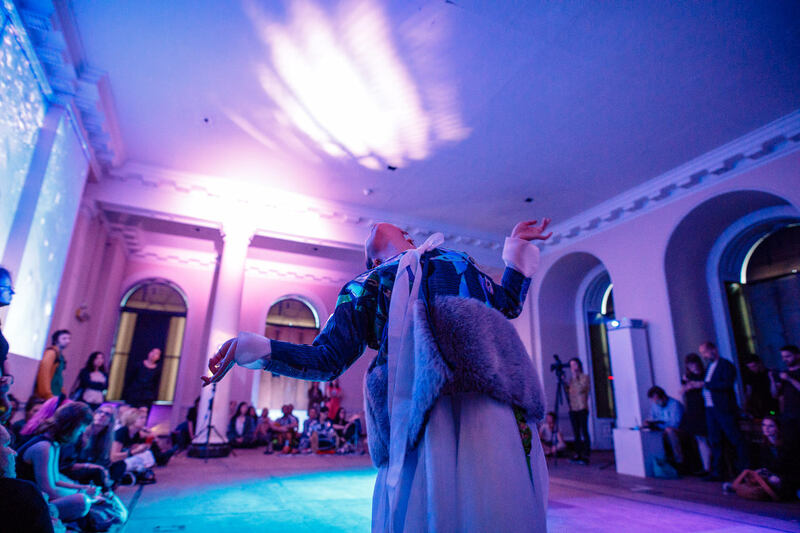 Within the dimmed Lancaster Rooms, amid its neo-classical columns, the audience steps into another world. Zadie Xa’s piece is inspired by Pansori, a Korean genre of storytelling performed by a vocalist and drummer. Here, three costumed figures circumambulate the twilight performance space. Their robes, overlain with silvery symbols and decorations, glimmer in the strange, multihued light. Footage from a grey and rainy, stone beach is projected onto the walls. All around was the steady rhythm of a drum, overlain with the sounds of rain and water. The performance, initially, seems to be a piece of ‘traditional’ theatre, led by Joonhong Min and his bright singing. Yet it is merely a shade, or a memory. Xa’s interpretation of her Korean heritage is through the lens of a rather different cultural framework. From the backing tracks to the sampling, this is more a representation of a hip-hop album. The syncretism may not be new, but it remains entertaining when done right. Above this pounding bass vortex, stars and galaxies whizz by. We are on some mystic plane – or perhaps inside the mind of the artist. As the demonic narrator she begins to conjure up her tale, directing and commanding the dancers to resume their roles. Zadie Xa as the demon narrator. Jane Chan as the Manshin. The autobiographical fable describes the spiritual journey of a disturbed Manshin, or shaman. Falling into a magical underwater realm, she encounters a proud, talking octopus. Even down there, the Manshin construes the world through contemporary points of reference – the homeboy, Gucci belts and oil slicks. Here, the two begin their discourse on belonging and the nature of an ancestral past. Min brings the Octopus to life with a swagger and grand flourishes. Jane Chan’s Manshin deftly glides, spins and whirls, even through the finale’s rapid crescendo. Xa is a compelling storyteller, her voice measured and melodic in expressing Taylor Le Melle’s lyrical writing. Some of her words became muddied by speaker distortion, but through her purposeful, gesticulating presence the import remained clear. Crash, Boom, Hisssssss. Legend of the Liquid Sword is as much pure theatre as it is performance art. From costume to narrative to individual performances, every aspect of this all-encompassing production is well put together. Xa has demonstrably succeeded in marrying two otherwise contrasting genres that reside within her. The result is a great spectacle that is both highly entertaining and deeply thoughtful. A very cool experience. Performance Reviewed was kindly invited to the performance by Block Universe. All images © Arron Leppard, 2017; Courtesy Block Universe.